Ugreen USB 3.0 gigabit 10/100/1000Mbps ethernet network adapter enables you to add a network interface to your computer via USB. It is backward-compatible with all existing 10/100 networks. With it , you could replace a broken internal network card, add a separately routable network interface, and transferring files peer-to-peer over Ethernet. Simply insert the adapter into a USB 3.0 port on your computer and begin to transfer large video, audio, and graphics files between your workstation and the network. 1.Drivers built in, no driver install required--on Chrome OS, Windows 10/8.1/8. 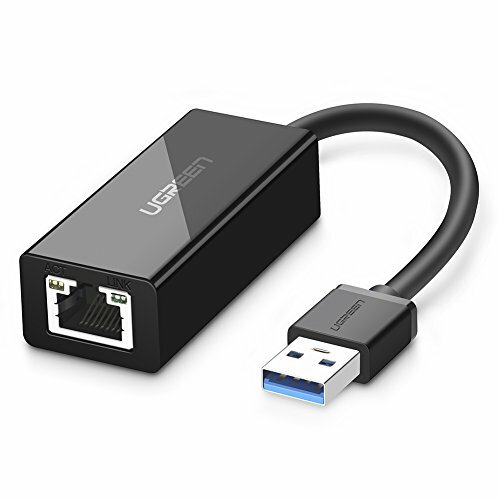 WHAT IT IS: Ugreen USB 3.0 male A to RJ45 female ethernet adapter connects your computer or tablet to a router,modem or network switch for network connection. It adds a standard RJ45 port to your Ultrabook, notebook, Nintendo Switch or Macbook Air for file transferring, video conferencing, gaming, and HD video streaming. PROTECT OR REPLACE A BROKEN ETHERNET PORT: USB 3.0 to Gigabit Ethernet Adapter is a good accessory to protect the RJ45 Lan port in your expensive computer, or replace a broken Ethernet port. SPEED UP TO 5GBPS: Full 10/100/1000Mbps gigabit ethernet performance over USB 3.0's 5Gbps bus, faster and more reliable than most wireless connections. Link and Activity LEDs. USB powered, no external power required. Backward compatible with USB 2.0/1.1. COMPATIBILITY: This USB to Gigabit Ethernet adapter work with Windows 8.1/8/7/Vista/XP, Mac OSX 10.6/10.7/10.8/10.9/10.10/10.11/10.12, Linux kernel 3.x/2.6, and Chrome OS. DO NOT SUPPORT Windows RT and Android. Compatible with IEEE 802.3, IEEE 802.3u and IEEE 802.3ab. Supports IEEE 802.3az (Energy Efficient Ethernet). LIFETIME WARRANTY: Ugreen USB Gigabit Ethernet adapter is backed with lifetime warranty and customer service support.